The Global Volcanism Program has no activity reports for Visoke. The Global Volcanism Program has no Weekly Reports available for Visoke. The Global Volcanism Program has no Bulletin Reports available for Visoke. The symmetrical Visoke volcano is the NE-most of a cluster of large stratovolcanoes at the southern end of the Virunga Range on the border of the Democratic Republic of Congo and Rwanda. The 3700-m-high stratovolcano contains a 450-m-wide lake in its summit crater. A NE-SW-trending fissure zone has produced many cinder cones NE of the trachyandesitic volcano. An eruption in 1957 formed two small cones on the north flank, 11 km from the summit. There is no Deformation History data available for Visoke. There is no Emissions History data available for Visoke. The symmetrical Visoke volcano is the NE-most of a cluster of large stratovolcanoes at the southern end of the Virunga Range. The 3711-m-high stratovolcano contains a 450-m-wide lake in its summit crater (left center). Lobate lava flows descend the flanks of the volcano. A NE-SW-trending fissure zone has produced many cinder cones NE of the volcano (top). 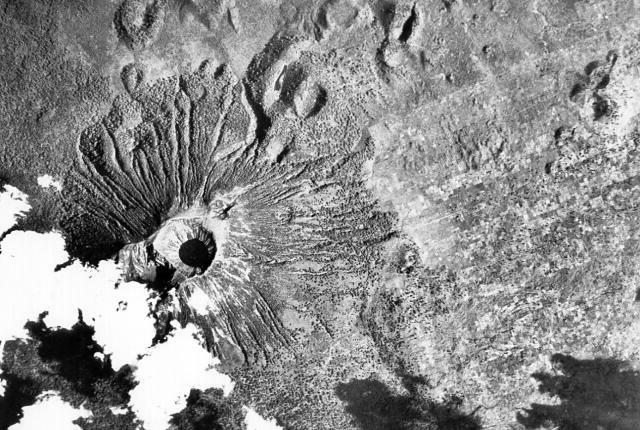 An eruption in 1957 formed two small cones on the north flank, 11 km from the summit. Aerial photograph courtesy of Henry Luc Hody (Belgian ambassador). There are no samples for Visoke in the Smithsonian's NMNH Department of Mineral Sciences Rock and Ore collection. IRIS seismic stations/networks Incorporated Research Institutions for Seismology (IRIS) Data Services map showing the location of seismic stations from all available networks (permanent or temporary) within a radius of 0.18° (about 20 km at mid-latitudes) from the given location of Visoke. Users can customize a variety of filters and options in the left panel. Note that if there are no stations are known the map will default to show the entire world with a "No data matched request" error notice. Large Eruptions of Visoke Information about large Quaternary eruptions (VEI >= 4) is cataloged in the Large Magnitude Explosive Volcanic Eruptions (LaMEVE) database of the Volcano Global Risk Identification and Analysis Project (VOGRIPA).